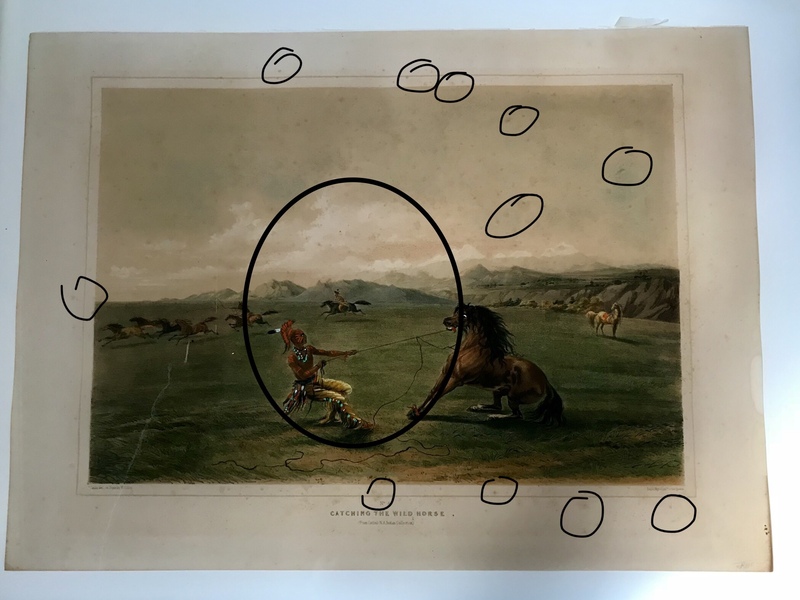 The initial condition of this George Catlin (1796-1872) print suffered from stains, discoloration, and severe foxing. Foxing is a condition where a brown discoloration appears. The origins for this are somewhat unknown. It’s believed to either be a fungus growth, or an oxidation agent from the components in the paper, or both. The good news is that foxing does not compromise the integrity of the paper. We’ve circled just some of the foxing. The larger circle shows a slight magnification which helps bring out the rich colors and detail of the Native America–some of the strong qualities of this print. The above photographs show the print going through a solution bath. This reduced the foxing and brought out the blue in the clouds, and the white-capped mountains in the distance. We’re getting closer to how the artist envisioned it. Once the print was out of the solution bath, further cleaning was carried out to achieve these pristine results. Crisp whites, most dramatically in the eye of the central horse but also along the paper’s border, heightened detail in the complex grass areas, and an increase feel of the texture in the background. Also noteworthy is a spot at the bottom left of the last picture. There’s a little pinhole where the printer used to place the print. Restoration will conclude with a custom frame. Stay tuned for more . . .